Before we get into the Pot Roast recipe, here are some tips on making a perfect braise. braising liquid. It pays off in the end when you’re rewarded with a very flavorful sauce from an exchange of flavors between the vegetables, the braising liquid and the meat juices. 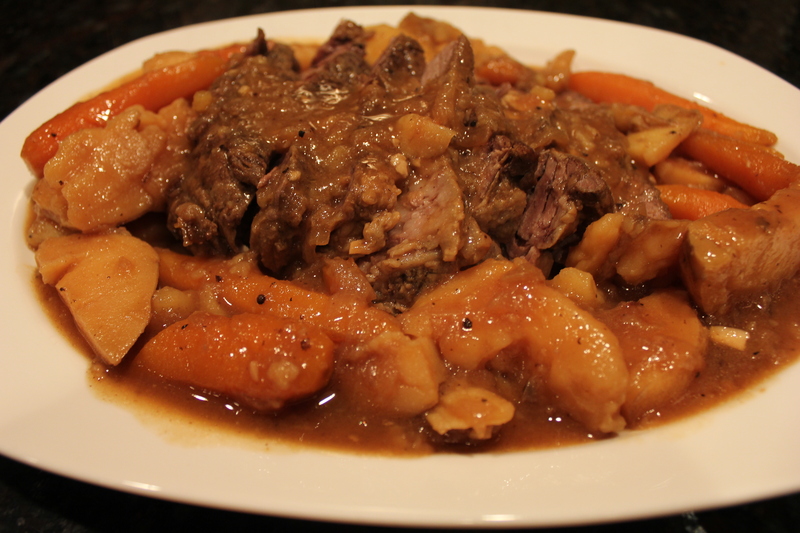 Pot roast is a large piece of meat, but don’t be tempted to add more liquid than I suggest. I have taken pictures to show you that the braising liquid increases early in the cooking process. Everything cooks thoroughly and the flavor is robust. 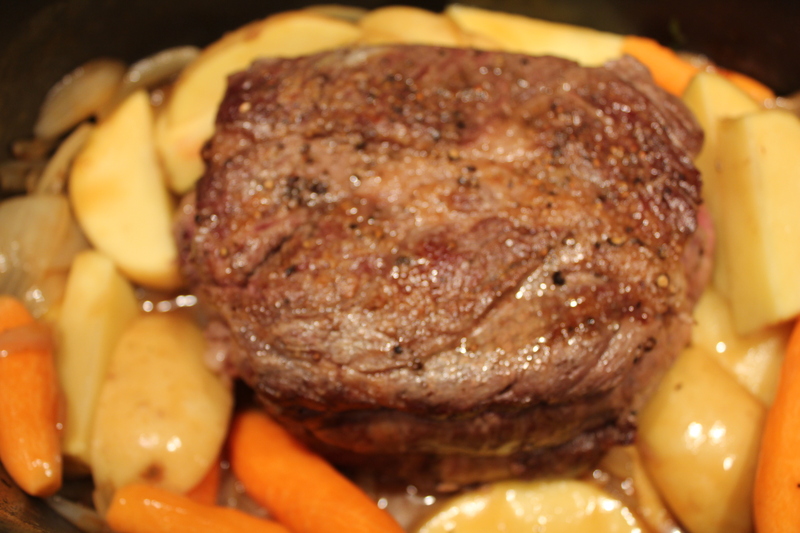 Pot roast is a very simple braise. Brown the seasoned meat and set aside. Sweat the onions, add large pieces of carrots and potatoes, some bay leaves and braising liquid. Cook until tender. 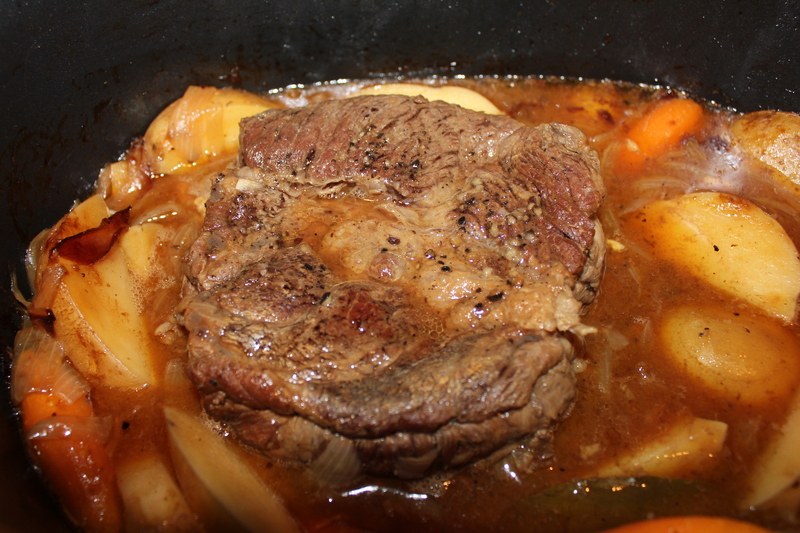 Braised dishes are best if left to sit overnight. It intensifies the flavor and, since the meats used in braising are fatty, the fat sits on the surface and solidifies overnight, just scrape it off before reheating. Slice the meat and place on a platter surrounded by the vegetables and cover with a little gravy. Season both sides of the pot roast with salt and pepper. Heat the oil in a 7-quart Dutch oven or large saucepan with a cover over high heat. 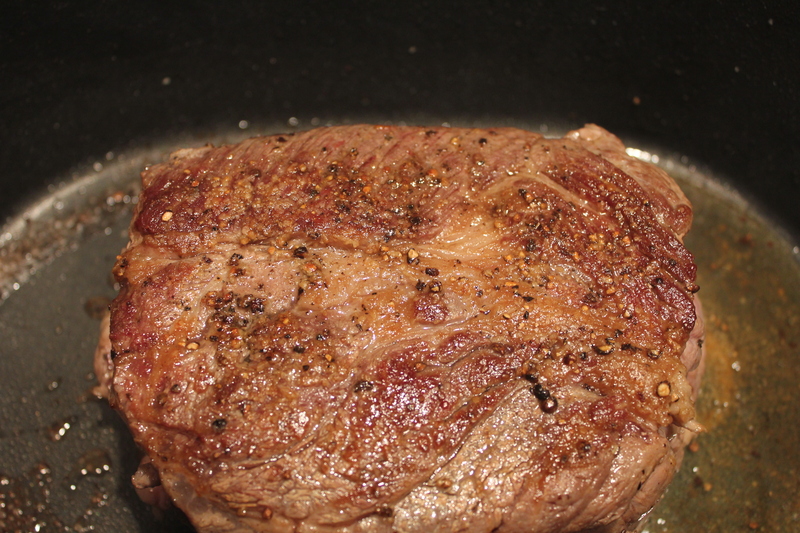 Add the seasoned pot roast to the hot oil and lower the heat slightly. Brown the top turn and brown the bottom. Remove the meat and add the onions to the hot pot over medium heat. Cover and sweat for 3 minutes. Uncover, raise the heat a bit and sauté for several minutes until lightly browned. Toss in the garlic and stir until fragrant, about 30 seconds. Stir in the stock, potatoes, carrots, bay leaves, salt and pepper. Return the meat to pot, pushing a few vegetables aside to snuggle the roast in. This is where it takes a little faith. The amount of liquid is minimal. Bring this to a boil, lower the heat to barely a simmer, cover and let cook for 2 1/2 to 3 hours or until fork tender. For a slow cooker set on low for 6 hours. 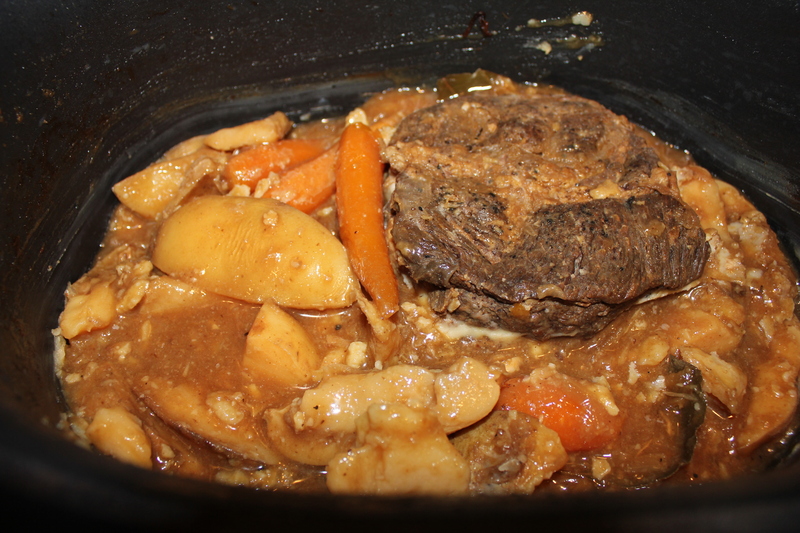 This picture shows the pot roast after 3 hours cooking (I used a slow cooker) – notice the increase in liquid at the halfway point. Cool the roast, refrigerate overnight and then remove the fat. Reheat, slice and serve. The gravy thickens from the starch in the potato, no need to add flour. Heat the oil in a 7-quart Dutch oven or large saucepan with a cover over high heat. 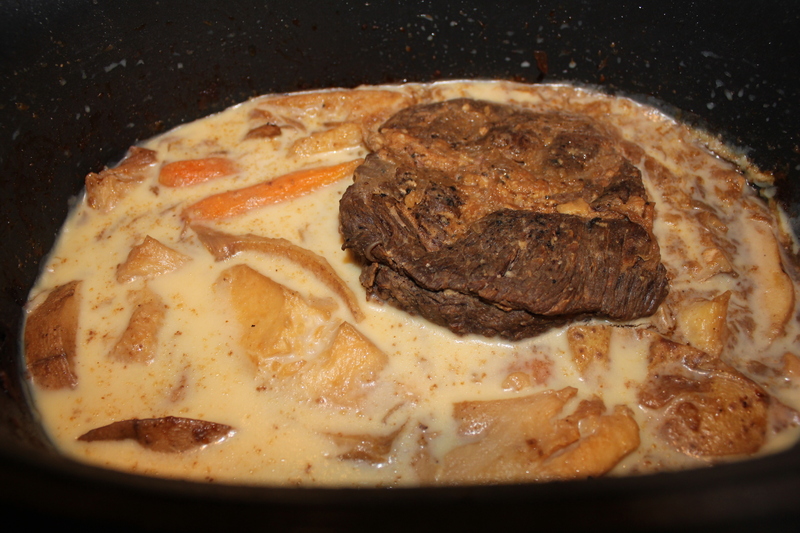 Add the seasoned pot roast to the hot oil and lower the heat slightly. Brown the top turn and brown the bottom. Remove the meat and add the onions to the hot pot over medium heat. Cover and sweat for 3 minutes. Uncover, raise the heat a bit and sauté for several minutes until lightly browned.